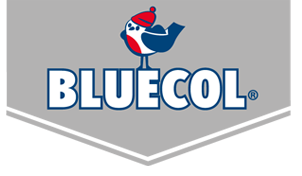 Bluecol Screenwash & De icer is a dual action formula which can be used as a high power concentrated screenwash or a fast acting De icer. Simply squeeze the contents into the washer bottle to help prevent freezing down to -36Â°C when used neat or squeeze and squirt onto the windscreen when frozen for fast acting, effective defrosting of ice. 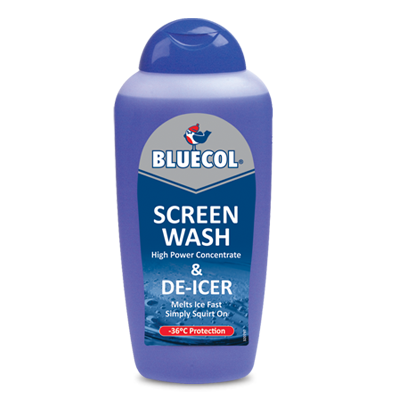 Bluecol Screenwash & De icer also contains a glass cleaner, for better and safer visibility in winter driving conditions. Bluecol Screenwash & De icer will not damage wiper blades or rubber seals and is compatible with modern polycarbonate and plexiglass head lights. 1.Remove any heavy deposits of snow and ice. 2.Position Bluecol De-Icer bottle close to the windscreen. Starting at the top, move across and work down, holding bottle in an upright position. 3.When ice melts remove the surplus with windscreen wipers. 4.Wipe off excess with a clean cloth to prevent re-freezing.